At game conventions, I like to wander the Dungeons & Dragons game tables, watching dungeon masters in action. I see plenty of skills worth copying. Nearly all DMs bring enough from their home games to run a fun session. But sometimes I see weaknesses too. All of us have areas to improve. By far, the most common flaws stem from traits seldom practiced at a kitchen table or at a friendly little game store. Convention games demand extra skills. Project your voice. At home, you can look down at your papers while speaking like a golf announcer. At a convention, the din of 50 tables means conversational speaking gets lost. Players feel reluctant to stall the game, so they rarely ask you to repeat. Tim Kask, the first editor of The Dragon, played his first D&D game at Gen Con in 1974. He only heard half what the DM said, so he felt “completely bewildered.” Today’s players react the same way. They sit politely, lost and hoping to catch up. At a convention, look at the players as you speak, and then project your voice to the next table over. When I DM, I like to take the seat nearest to the wall so players facing me don’t hear extra noise from a table behind me. It can’t hurt. Own the adventure. 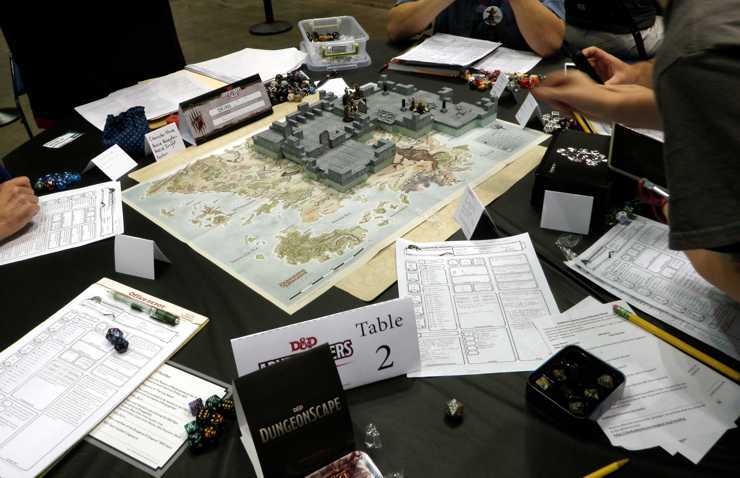 At a convention, most DMs work from an adventure written by another author. We probably don’t even get to choose which adventures we run. A few dungeon masters muddle through such adventures with the enthusiasm they would bring to reading assembly instructions to someone with a screwdriver. Perhaps they apologize for aspects they don’t like, or share a monologue on their interpretation of the text, or meditate aloud on a non-player character’s motives. Stop that. When you run another author’s work, adopt it and find a way to love it as your own. If you need to make a few tweaks, then make them, but keep the adventure’s essentials intact. Some of the fun of organized play comes from sharing a common experience with folks who played the same adventures as you. For an example of how I tweaked an adventure to suit me, see Running Shackles of Blood: Making the good adventure into a great session. Fill the available time with a beginning, a middle, and an end. When I DM convention games, I often check my watch. I worry that players might suspect I have somewhere I would rather be, but really I’m tracking our progress. When folks sit down for a convention game, they want to experience a beginning, a middle, and an end. Also, they paid about $10 for the slot, so they want the game to fill most of the time. To pace a convention adventure, you must estimate how long the finale will take. As you play through the middle, if scenes run long, plan short cuts that can take the characters to the end. Perhaps this means the players reach the final scene without meeting every challenge in the adventure. Or maybe the monsters in a drawn-out combat suddenly have 1 hit point. See How to end combat encounters before they become a grind. In episode 3 of the DM’s Deep Dive podcast, Shawn Merwin gives more advice on pacing D&D under time constraints. For the story of my struggle stretching a 2-hour adventure into a 4-hour slot, see What Murder in Balur’s Gate Taught Me About Engaging Players in Role Playing. If you ever DM in public, mind your volume, enthusiasm, and the clock. All three skills come more from attention than from special expertise. These three small additions to your game will let your players see the talent you bring to your home game. This entry was posted in Adventurers League, Advice, Conventions and tagged Shawn Merwin, Tim Kask. Bookmark the permalink. One observation I have found with “Own the adventure” – throw out most of the flavor exposition and let the flavor come through in the monsters, NPCs, how they act and the situation the players find themselves in. I only run adventures from my ongoing campaign world at conventions. Most of the players won’t care about backstory, history, the intricacies of the scenario from a 9 year old campaign – they want to be pointed at a situation and GO! I start off with a bang usually – combat within the first 5 minutes. It’s in how my orcs act with almost religious suicidal fanaticism, how the NPCs praise “The Light” when they are healed with CLW, how the tavern keeps scoop up the cash box and cover their belt pouches when halflings are in the room, that shows them that they are in a different world. Show, not tell. That seems to work best. This is a great article. Helpful, empowering and with solid suggestions. I was having a lot of grumbles over running a prepared adventure for an upcoming game. This makes me feel a lot better about my decisions to hack and modify it! Great advice. Game masters running at their busy FLGS should also heed it. Meh, I don’t know. I think we have become too willing to accept poorly written adventures and we expect DM’s to do the lifting to solve that problem. A well written adventure is engaging, has appropriate internal pacing, and gives you the tools you need to make the story meaningful. If it’s not well written, don’t run it. If we just accept garbage as the norm, then you will get more garbage. The voice projection does matter – that’s super hard on Sunday, but Thursday and Friday you should be able to belt it like an opera diva. I’d say that for me, the biggest learning curves were around making sure EACH player feels like he or she gets a chance to shine and is being heard, as well as around appropriate use of in-character vs. out-of-character communication. You can see the shadows of two creatures sitting at a table in the adjoining room. “This elbow joint is overcooked, I knew we should have cut their throats instead of burning them alive,” says one of the creatures. “Yeah, but the light show and music waz sooo good,” the other replies. That sort of thing is what brought my DM’ing from a C to an A-. Solid advice all around, especially about time management! I can’t tell you the number of convention games I’ve played in where GM’s have really screwed this up. I’ve been stuck in games where one third to half the time was chewed up with character generation and shopping and nearly the rest of the time was spent trying to “find” the adventure. Then, when the GM realized time was nearly up he threw together a lousy and rushed ending! The only thing I would add to your list for GM’s is to leave the “sandbox” at home! Convention players want a great episode, not an interesting campaign. Use pre-gens, give the heroes a specific assignment or circumstances that have to be reacted to. This is the key to keeping things on track; the players’ decisions should be reactions to the story events!